Albion's final pre-season friendly will now take place against FC Nantes at the Amex on Friday, August 3, as Sporting CP are unable to fulfill the fixture. The Seagulls kick-off their Premier League campaign away to Watford on August 11 and their final warm-up game will now be against Nantes, who finished ninth in Ligue 1 last season. Sporting CP have had a number of issues in the past few months and there have been several changes at the club in the past few weeks. The Portuguese club have pulled out of the Amex friendly as they wish to play a home game that weekend but Brighton have confirmed fans with tickets for the Sporting CP game will be able to use them for the match with Nantes. 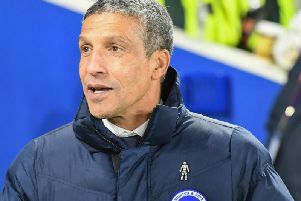 Albion boss Chris Hughton said: “Firstly, we are extremely grateful to FC Nantes for coming over to play us at such short notice. “It was important for us to have top-level opponents in our final warm-up match ahead of the new season, and we are delighted FC Nantes have stepped in to play the match in two weeks’ time. Brighton chief executive Paul Barber added: “It’s disappointing to have to rearrange the match at such short notice, but, with several changes in senior level personnel, coaching staff and players in the past few weeks, Sporting now wish to play at home over the weekend of August 3-5, and so we are very grateful to FC Nantes for rearranging their own plans and for stepping in to take Sporting’s place. Ticket holders wishing to apply for a refund must do so no later than 5pm on July 26, 2018. Contact Albion's supporters services by email supporter.services@bhafc.co.uk sending your original confirmation email along with a request for a refund, or call 0844 327 1901 (calls cost seven pence per minute plus your network access charge).